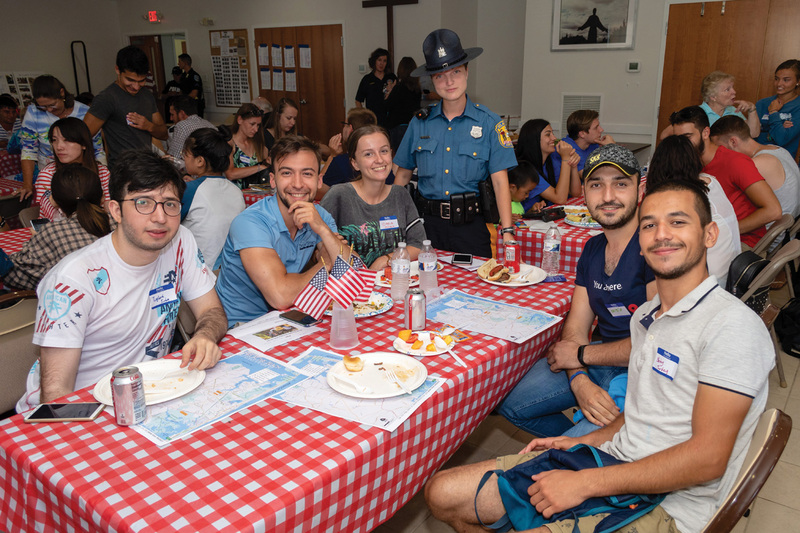 Trooper Irina Celpan mingles with some international students at a picnic at St. Martha’s Episcopal Church in Bethany Beach earlier this summer. Trooper Irina Celpan graduated from the Delaware State Police Training Academy in February of this year and has swiftly put her language skills to use. She is newly assigned to Troop 4 in Georgetown and is fluent in Russian and Romanian, in addition to English. Celpan, from the nation of Moldova, has first-hand experience as a J-1 student during her time spent in the area in the summer of 2012. She participated in the work-study-based exchange and visitor program that promotes cultural interactions where visitors teach, study, receive training or demonstrate special skills. The J-1 program is also for students who need practical training that is not available to them in their home country. Celpan’s Eastern European roots and excellent language skill sets have made her a great asset for the Delaware State Police and our local law-enforcement partners alike. Celpan is lauded for her efforts and goodwill by her colleagues. She graciously makes herself available to the students working at the beach and makes them feel she is approachable. She has been in high demand from our local law-enforcement partners at the beach to help them with their community-outreach efforts. Celpan has attended three safety seminars, on May 30, June 13 and June 27, that were held at the Edgewater House in Sea Colony near Bethany Beach. Working with the Bethany Beach Police Department, Celpan educated the foreign J-1 students on bicycle safety laws, victimization and personal safety this summer. She had the opportunity to share experiences from her perspective as a student. She explained to the students the importance of having goals and pursuing them. She also touched on the differences between police in the United States and police back home in her country of Moldova. On June 26, she was invited to Saint Martha’s Episcopal Church in Bethany for the International Student Picnic. While working with the Ocean View Police Department, Celpan attended this event with more than 100 students from Romania, Moldova, Russia, Ukraine, Belarus, Croatia, Poland, Ireland and Kazakhstan. The church volunteers welcomed the students with local foods, such as hamburgers, hotdogs, fried chicken and cookies. It was an opportunity for them to meet other students and local residents. Celpan spoke to both Romanian and Russian students, and answered questions about summer jobs, housing, trips, vehicle rentals, shopping and local transportation. In 2012, Celpan worked as a cashier in Bethany Beach, at the Valero Gas Station on Route 26, and her second job was at Tim’s Aloha on the boardwalk, serving shaved ice. She had only two days off during the summer of 2012 and never complained, working toward her personal goals. She learned the quality of hard work and the ability of surviving in a country full of strangers. She bought her first vehicle during the winter of 2013, which she said helped “me to spread my wings towards other jobs, other towns.” She was later hired at IHOP in Rehoboth as a server. She met many friendly and regular customers who encouraged her to go to college. In August of 2015, she registered at the Delaware Technical Community College in Georgetown. She took advanced English classes during the first semester at DTCC and obtained a certificate for finishing the English as a Second Language program. She also pursued classes for a criminal justice major. She participated in the Law Enforcement Option Program during the last semester and graduated from Delaware Technical Community College with a 4.0 grade point average, with the Outstanding Student Award, in 2017. She also joined the Dover cadet program for two years, where she enforced city ordinance violations and provided security and assistance at special events. “I truly believe if you communicate to people in a way they can understand, one can make a connection; however, if you speak to them in their own language, it can touch their heart,” Celpan said. “I, as a Delaware state trooper, want tourists, international students and locals to understand that ‘justice’ has no limits and they should not be afraid to trust us. Sgt. Richard Bratz is the director of public information for the Delaware State Police.